Other cultures deal with a legacy of torture by declaring "Never again!" Why do so many Americans insist on dealing with the current torture crisis by crying "Never before"? I suspect it stems from a sincere desire to convey the seriousness of this administration's crimes. And its open embrace of torture is indeed unprecedented. But let's be clear about what is unprecedented: not the torture, but the openness. Past administrations kept their "black ops" secret; the crimes were sanctioned but they were committed in the shadows, officially denied and condemned. The Bush administration has broken this deal: post-9/11, it demanded the right to torture without shame, legitimised by new definitions and new laws. Despite all the talk of outsourced torture, the real innovation has been in-sourcing, with prisoners being abused by US citizens in US-run prisons and transported to third countries in US planes. It is this departure from clandestine etiquette that has so much of the military and intelligence community up in arms: Bush has robbed everyone of plausible deniability. This shift is of huge significance. When torture is covertly practised but officially and legally repudiated, there is still hope that if atrocities are exposed, justice could prevail. When torture is pseudo-legal and those responsible deny that it is torture, what dies is what Hannah Arendt called "the juridical person in man". Soon victims no longer bother to search for justice, so sure are they of the futility, and danger, of that quest. This is a larger mirror of what happens inside the torture chamber, when prisoners are told they can scream all they want because no one can hear them and no one is going to save them. The terrible irony of the anti-historicism of the torture debate is that in the name of eradicating future abuses, past crimes are being erased from the record. Since the US has never had truth commissions, the memory of its complicity in far-away crimes has always been fragile. Now these memories are fading further, and the disappeared are disappearing again. This casual amnesia does a disservice not only to the victims, but also to the cause of trying to remove torture from the US policy arsenal once and for all. Already there are signs that the administration will deal with the uproar by returning to plausible deniability. The McCain amendment protects every "individual in the custody or under the physical control of the United States government"; it says nothing about torture training or buying information from the exploding industry of for-profit interrogators. The flat track Ohio Roller Girls are skating their first exhibition bout this Saturday, December 10th. Wow Family Fun Center, 4900 Evanswood Drive, Columbus Ohio. 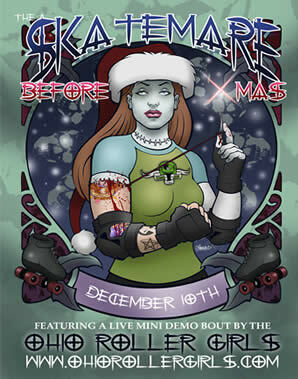 Admission is $12, $8 with toy donation. Please visit the Ohio Roller Girls website for more info. Why? Because here in Narnia is the perfect Republican, muscular Christianity for America - that warped, distorted neo-fascist strain that thinks might is proof of right. I once heard the famous preacher Norman Vincent Peel in New York expound a sermon that reassured his wealthy congregation that they were made rich by God because they deserved it. The godly will reap earthly reward because God is on the side of the strong. This appears to be CS Lewis's view, too. In the battle at the end of the film, visually a great epic treat, the child crusaders are crowned kings and queens for no particular reason. Intellectually, the poor do not inherit Lewis's earth. 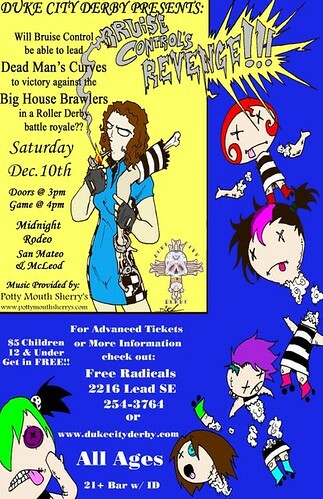 The flat track Duke City Derby will skate their second exhibition bout of the season this Saturday, December 10th. Dead Man's Curves take on the Big House Brawlers. Tickets are $5, 12 and under free. Doors open at 3pm, bout at 4pm. Please visit the Duke City Derby website for more info.